I've been in a hiatus from blogging lately, mainly because free time has been in short supply. It's not just the very busy days at work, nights have been even busier. Instead of churning out long blog posts, I've been banging on code instead, day and night. Unfortunately I only get paid for the code I write during the day, but surprisingly (or not) I enjoy the code I write at night the most. I have written code for banks, multinational corporations, the kind of places where the phrase "professional dress code" is not used strictly in jokes. I've helped build software that was resilient, scalable, secure and intuitive, although granted, not all those at the same time. This was mainly Custom Enterprise Software, or to put it more plainly, Software That Runs On Computers At Work. So I thought I'd try a different angle in my spare time: write software that people use at work, or at home. Or at a coffee shop. Or at the airport. Or wherever they feel like using a computer, anyway. This is sometimes called End-User Software, or to put it in layman's terms, Software People May Actually Like. After trying out some ideas that didn't seem worthwhile, I discovered that some of my buddies had similar thoughts. This is how FireStatus was born. FireStatus is a Firefox extension that aims to be a swiss army knife for dealing with various social networks, right from your browser, without visiting any particular website. Facebook, Twitter and FriendFeed are currently supported, but more are in the pipeline. For starters, it allows you to simultaneously update your status to all or some of these services, so that all your friends see it, no matter what they are using. The notion of a status that is occasionally updated is familiar to Twitter and Facebook users, since the text field that asks 'What are you doing?' is prominent in their user pages. FriendFeed does not have the notion of a status, but its users can post short (or long) messages, just like Twitter's. FriendFeed also allows posting links to web pages, accompanied with a short description, something that many Twitter and Facebook users have been doing by constructing status updates that start with the description text and are followed by an appended link, usually shortened. 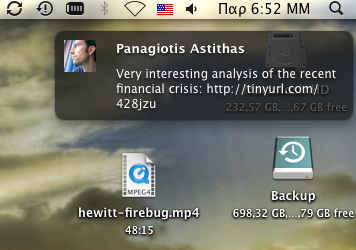 FireStatus can ease the task of posting these messages or status updates, by being always available, instead of needing to have the service pages open and without a large memory footprint, like other similar applications, since it takes advantage of the fact that most people nowadays always have one browser open. I know I do. Come to think of it, I don't know anyone who uses computers that does not keep a browser running most of the time. At least untile the darned thing crashes, which fortunately is something I haven't experienced in Firefox for quite some time. Enabling the spell checker in the status message field, for catching those typos when hastily typing a message. Having the URL inclusion unchecked by default, while the shortening checked, since most posts do not include URLs (and it might be embarrassing if done inadvertently), but those that do usually want them short. Adding a character counter to help guard against the maximum message length imposed by some services (e.g. Twitter). Tightly placing the available services in a way that allows for an unambiguous selection. Using the Escape and Enter keys as shortcuts for canceling and sending the update respectively. As one reviewer in addons.mozilla.org so eloquently put it, "the simplicity & minimal design are the key components here". Posting is not the whole story, though. These services provide continuous streams of updates from friends that we need to monitor. Sifting through the updates in every service, while very useful, becomes tedious after a while. It is like making a mental note to check your e-mail every once in a while for new messages. It's one way to do it for sure, but mail notifiers have been around for ages and provide more of a "live" experience. FireStatus imitates their success in making e-mail conversations "alive", for conversations in the social network space. Every time a new incoming update is received, a notification popup appears, so I can continue using whatever application I was using, but being instantly aware of the news. 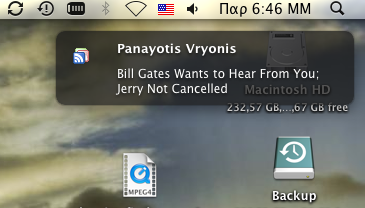 Twitter notifications contain the name and the picture of the message author as well as the message sent. Low-priority or uninteresting messages can be just glanced at and then automatically dismissed, while important ones can be clicked on, so that the message can be viewed in the browser. FriendFeed notifications can be of various flavors, since FriendFeed aggregates updates from a large variety of online services. Therefore FriendFeed updates display the service icon along with the author's name for quick identification of the type of update. Clicking on an interesting update opens a browser window to the link contained in the message. Facebook notifications currently contain new message counts, pokes and shares, but work for getting more data is underway. Although the notifications appear instantaneous, as with e-mail notifications there is a polling process involved underneath. The polling frequency for each service can be separately tuned in the preferences window. The preference window can be opened by right-clicking on the FireStatus icon and selecting the appropriate option in the popup menu. Along with the time intervals between polling for updates, one can enable posting and/or receiving updates for the various services, as well as the authentication credentials where appropriate. For Facebook the user logs in in a Facebook-supplied browser window that pops up, similar to regular Facebook use. No credentials need to be stored separately by FireStatus. 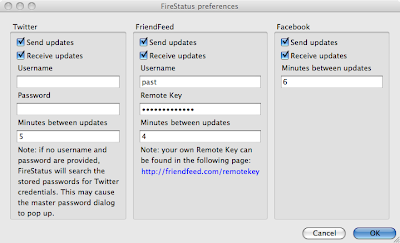 For FriendFeed the username and remote key have to be stored locally in the extension preferences. The remote key is not the same as the user password, but is provided by FriendFeed specifically for use by third-party applications, like ours. It can be found by clicking on the link displayed in the explanatory note. Twitter can work either way. If a username and password are entered in the preference window, they will be stored locally in the extension preferences and used for subsequent authentication. If, on the other hand, the fields are blank, FireStatus will consult the browser's Password Manager for any stored Twitter credentials. This will probably cause the master password dialog to pop up once, but the credentials will remain stored only in the Password Manager. Since we built this thing for our own personal use, pleasure and self-punishment, and as we don't plan to ever get rich out of it, we have released it from the beginning as open-source software through the permissive BSD license. You are most welcome to come by the project's home at Google Code, study the code, fix a bug (or two), help with the (embarrassingly outdated) documentation, contribute a review (otherwise it will remain an experimental extension forever) or just chat with us at the mailing list. Heck, if you feel like it, you can grab the whole code and use it in your own lucrative business and you don't owe us a dime. With the shape the world economy currently is in, you probably couldn't afford it, anyway.